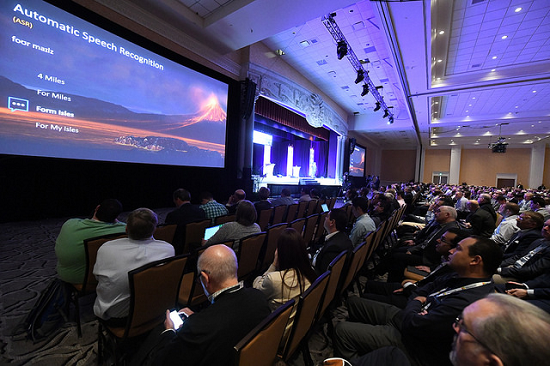 A sampling of vendors that shared team collaboration-related news earlier this month at Enterprise Connect. As expected, team collaboration featured among touted products at Enterprise Connect earlier this month, with exhibitors such as Amazon Web Services (AWS), Avaya, CounterPath, IBM, and Microsoft (as previously covered) making moves with their persistent collaborative workspace apps. AWS took advantage of the keynote stage to sprinkle in news of its team meetings tool, Amazon Chime, in a talk otherwise devoted to its voice-enabled digital assistant for the office, Alexa for Business. Demoing the ability to open a Chime meeting by Alexa voice command, David Itbitski, the company's chief evangelist for Alexa and Echo, shared an updated pricing scheme for the team collaboration tool. Effective April 1, AWS will be offering usage-based pricing for Chime. It's moving to this model to better serve those users who aren't regularly hosting meetings, but do attend them and use Chime's other features, such as point-to-point video and chat, wrote Jeff Barr, chief evangelist for AWS, in an announcement blog. New users can sign up for a 30-day trial that gives them free access to all Chime features. Once the 30-day period ends, users can chat and attend meetings at no cost. When they host meetings, they'll pay a $3 per day charge, capped at $15 per month. "Based on historical usage patterns, this will result in an overall price reduction for virtually all Amazon Chime customers," Barr wrote. For scheduling and hosting capabilities, users must be connected to an AWS account using Amazon Pro features. Users do not need their own licenses, he added. Rather, administrators can use Active Directory settings and policy management within the Amazon Chime Console to set permissions. Coincident with usage-based pricing's arrival is the departure of the Plus plan, Barr said. Screen sharing and corporate directory features that had been available in that plan become part of the Basic plan. In one of a series of announcements, Avaya revealed that it's extending its Avaya Equinox UC client with the team collaboration and meeting capabilities of its Zang Spaces cloud service. Equinox users will be able to create and enter team spaces, and from within them place voice and video calls; chat; and schedule and host meetings. They'll be able to initiate the collaboration from within a team workspace or via the existing Equinox conferencing and meetings capabilities, said Mike Kuch, senior director of solutions marketing at Avaya. This UC-teams collaboration will help companies "cross the chasm" into the cloud, allowing the benefit of the cloud without needing to migrate their UC into the cloud, he added. Companies that bring on the new Equinox client will have free access to the team workspaces capability, Kuch said. At its EC booth, CounterPath shared a demo of Stretto Collaboration, which it had introduced heading into the event (see, "No Jitter Roll: Five for Friday"). Stretto Collaboration builds on top of the company's Bria softphone, which itself can sit in front of a mix of disparate communications systems to provide a unified user experience, Todd Carothers, EVP of Sales & Marketing at CounterPath, said. While Bria offers integrated voice, video, messaging, presence, and screen sharing, Stretto Collaboration ups those basics with a range of additional capabilities. These include the ability to join or initiate multiparty audio or video calls, as well as manipulate the video experience on the fly during live sessions -- adjusting video quality or video layout, for example. Team messaging, server-based HD audio and video recording with cloud storage, and a variety of one-click features also are available as part of Stretto Collaboration. Besides being able to complement Bria deployments on desktops and mobile devices, the collaboration service includes a Web interface, which non-Bria users can use to participate in collaboration sessions without having to download a Bria client. IBM Collaboration Solutions came to EC with an enhanced version of Watson Workspace, its team collaboration app. The enhanced app, called Watson Workspace Plus, brings embedded support for audio and video meetings, powered by Zoom. With Workspace, "there was one area we for sure realized we had a gap, and that was around a way for people to move seamlessly from asynchronous conversation, text typing into real-time audio/video meetings," said Ann-Marie Darrough, director of product management, IBM Watson Work, in a post-EC briefing. But not only does the embedded support facilitate a shift from conversation to meeting, it also enables the use of the core Watson artificial intelligence (AI)-based capabilities applied to conversations on meeting content, Darrough said. The core Workspace app includes AI-based features such as summarizations of channel conversations, prioritization of content, and suggestions on actions a user might want to take based on the context of a conversation. For meetings, Watson will transcribe the audio or video, and then provide the same sort of intelligence, she said. Only the person who starts the meeting needs a Plus subscription, and the host can invite guests via email, she added.